Modern GPUs continue to push the boundaries of 3D visuals, but their sheer horsepower has ensured they remain one of the PC's hottest and often loudest components. Take for example NVIDIA's recently-introduced GeForce GTX 480. The ultra-high-end card sports the world's fastest single GPU, but it lives on the edge of thermal constraints and its core has a habit of soaring past 90°C when put under load. In order to keep it cool, the card's reference fan is forced to run at speeds of over 3,000rpm, creating a notably noisy experience. Loud GPUs are nothing new, of course, and there's already an answer available in the form of the inevitable water-cooled editions. Trouble is, such cards tend to warrant a significant premium, and with the GPU's tendency to be quickly superceded by the next big thing, it isn't always a smart investment. But what if there was an easy-to-use liquid cooler that offered compatibility with every graphics card you ever purchased? Sound like a good idea? The folks at CoolIT Systems certainly thought so, and they've come up with a solution dubbed the OMNI A.L.C. (Advanced Liquid Cooler). 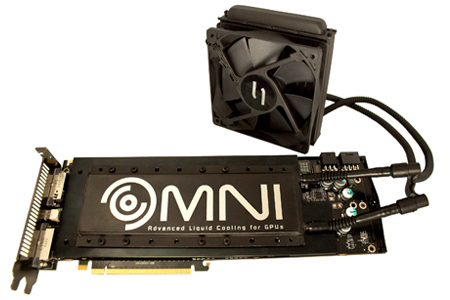 What we're looking at is what CoolIT describes as the industry's first "fully upgradeable, factory sealed, liquid cooled video card solution". Expected to launch in the coming months priced at around $199 (approximately £150), it could become the only GPU cooling solution you'll ever need. Let's take a look and see if it's up to the task.